If you’ve never tried using a rowing machine, you’re missing the benefits of a full-body, cardiovascular workout that is also kind to your joints. A Personal Training manager at the Burnsville Y suggests rowing a few times a week, for 30 minutes each cardiovascular- and strength-endurance session. Before jumping on a rowing machine, it’s important to learn the proper technique. Using incorrect form on a rowing machine can lead to back pain. The order of events is important—first push with your legs, next lean back slightly, then pull your arms into your chest. Reverse the order for the second-half of the movement. Throughout the movement, be sure to sit up straight and don’t round your back. Each time you pull with your arms (or “row”), stretch your chest muscles and engage your upper/middle back muscles. During the pushing phase of the row (also known as the “drive”), use the power and strength from your legs to push against the desired resistance. 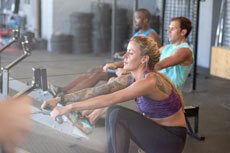 Once you’re rowing, pay attention to the timing of your strokes—strive for 22-26 per minute. Watch this video tutorial on using a rowing machine with correct form.